Today kicks off an exciting week to celebrate our friends, bees! Look out for fun interviews, recipes and giveaways! I am learning more and more about these amazing little guys, and have really grown to appreciate them for all that they do for us. I am excited to share with you some of what I have learned and introduce you to the people I have met in the process. We can learn a lot from our beautiful golden friends, bees. The honey bee collects pollen from flowers and trees in such a way to do the least amount of damage or destruction, then leaves them undamaged and alive, just the way the bee found them. We can thank our honey bee friends for their delicate kind approach to pollination, which helps to provide fruits and vegetables we love to consume. Without these mindful friends we would be without a lot of amazing fruits, vegetables, nuts and not to forget honey. These beautiful creatures have so many amazing qualities and help to better our earth, so I could not imagine trying to fit them in just one post. There is a great conversation happening in our world about the important roles bees play in our lives, here are some of the articles and videos I found informative and inspiring. 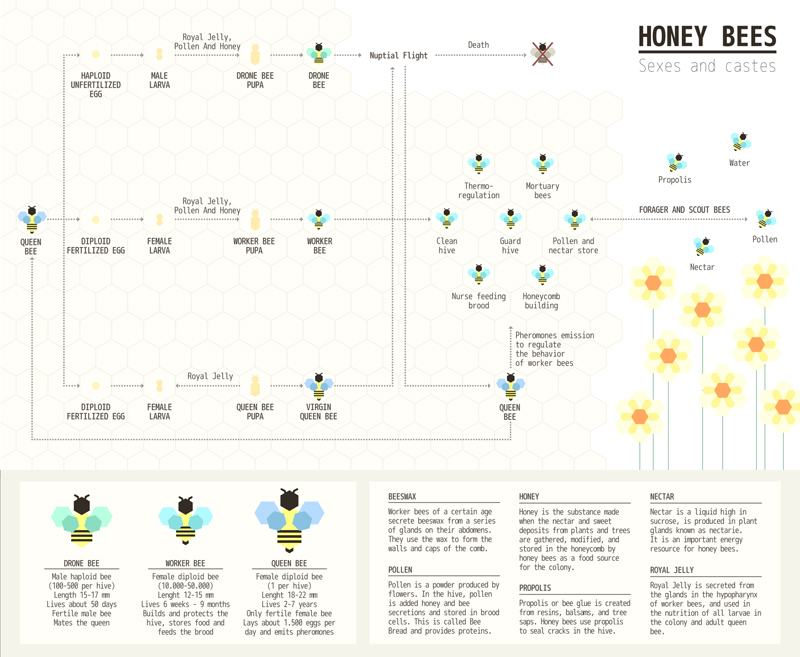 Below is a nice little graphic on the roles of different honey bees and the different materials the bees create. We will highlight different qualities and benefits bees bring to our lives and planet this week. “Bees visit flowers because they need to eat. They derive all of the protein they need in their diet from floral pollen, and all of the carbohydrates they need from floral nectar. As they fly from flower to flower, collecting pollen on their fuzzy bodies to take home as food, they end up transferring pollen from one blossom to another of the same floral species, and pollination just happens. “Part of the problem for our native bees is our human desire for neatness and uniformity. Pretty lawns with no bare spots. Non-flowering grass, or pollen-less flowers. Paved spots where a sand bank or brush pile may have been before. All places where a native bee might have made her home or found a snack.